Whether you bow before the gods of the sun or the water, a pool day at Caesars Palace is a royal treat. With all the Roman architecture and pools, you’ll feel like you’re in the heart of Italy. The seven Garden of the Gods pools offer a distinct experience for sun loungers and those who would prefer to make a splash. There’s a pool for every mood. If you desire poolside luxury, cabanas come equipped with cold refreshments and a fresh fruit plate. Entry into Garden of the Gods Pool Oasis is free for Caesars Palace and Nobu Hotel guests. 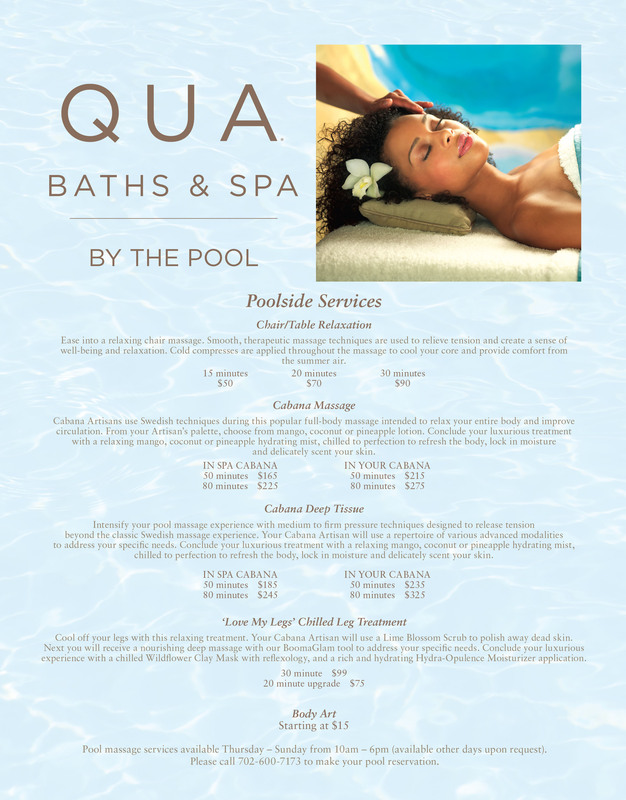 Escape the heat and relax in Qua Bath & Spa's air conditioned poolside cabana with services ranging from body art to deep tissue massage. Welcome to your paradise. Prepare to relax and unwind in this Iconic Caesars Palace pool surrounded by statues and waterfalls worthy of the gods. Cabana: Relax in your cabana dedicated to you and your comfort for the day, perfectly situated next to the pool. Daybed: Stretch out on your plush daybed dedicated to you and your comfort for the day, perfectly situated next to the pool. Lounge Chair: Enjoy the luxury of a centrally located, reserved seat allowing you to come and go as you please throughout your pool day. Neptune is everything you want to experience in a Vegas pool and more. With no shortage of energy, fun, and excitement, our largest pool keeps the party going all day. DJs, drinks, and Insta-worthy floaties in this action-packed pool are all part of the experience. Cabana: Party in true VIP fashion with an exclusive cabana equipped with a dedicated host, fruit tray, mini bar, two deluxe lounge chairs, misting cooling fans, a flat-screen TV, and more. Daybed: Stay in the heart of the action in complete comfort on your reserved daybed perfectly situated next to the pool. Lounge Chair: Treat yourself to a reserved spot where you can soak up some sun or take a dip in the pool surrounded by the action. If you are looking for a casual atmosphere to play in the sun, Apollo Pool is the spot for you. Dive into crisp waters, sunbathe on luxurious daybeds and lounge chairs or challenge your friends to poolside games on the turf lawn. Cabana: Grab your friends and party in a fun and luxurious Apollo Cabana. Fully equipped with a mini bar, two lounge chairs, a personal TV and dedicated cabana host, your experience will reign supreme. Daybed: Bask in the sun on your very own luxury daybed at Apollo Pool and don't miss a moment of fun with poolside games, weekend barbecues, live DJs and more. Lounge Chair: Bask in the sun on a dedicated lounge chair at Apollo Pool and don't miss a moment of fun with poolside games, weekend barbecues, live DJs and more. Family fun dominates this summer with a secluded, kid-friendly pool, featuring life-size games, themed floaties, bubbles, kid-friendly snacks, weekend activities and more. Cabana: Fun reigns supreme in a Jupiter Cabana, designed for you and your family. Enjoy oversized games, activities and more with your very own cabana host dedicated to making your pool experience one fit for royalty. Daybed: Soak up some sun and family fun while lounging poolside on a Jupiter Daybed at the most shaded pool of our complex. Lounge Chair: Kick back and relax on a Jupiter lounge chair and don't miss a moment of the fun while the family enjoys poolside games, themed floaties, toys and more. Play blackjack without leaving your summer pool oasis. Try your luck at the swim-up blackjack tables with easy access to the Fortuna Bar. Named after the Roman God of wine, this exclusive pool is reserved for invited guests and celebrities. With eight daybeds and eight cabanas, The Bacchus Pool is the perfect place to soak in the sun and enjoy a VIP experience. Dive into the exclusive 21+ playground at Venus Pool. Experience the best DJ beats, refreshing drinks and personalized service that Caesars Palace has to offer in an energetic and luxurious atmosphere. Cabana: Elevate your pool party experience at an exclusive Venus cabana equipped with a dedicated host, fruit tray, mini bar, two deluxe lounge chairs, misting cooling fans, a flat-screen TV and more. Daybed: Treat yourself to a daybed dedicated to you for the day where you can take a break from the pool, stretch out, and catch some rays. Lounge Chair: Reserve your spot to lounge amongst the gods in a perfectly situated chaise lounge chair by the pool. Services available Thursday - Sunday from 10 AM - 6 PM (available other days upon request). Please call 702-600-7173 to make your pool reservation. "While lots of hotels around the world have swimming pools, no place offers a pool scene quite like Las Vegas. With warm and pool-worthy weather from March through October, Vegas is the place to be to soak up some sun, relax in a luxurious setting, and party all day with friends." Garden of Gods Pool Oasis! is Caesars' own, highfalutin' title for the trio of pools -- the Temple, the Neptune, and the Venus -- which collectively span 4.5 acres, between Roman columns, elaborate marble and granite mosaics, and cabanas (available to rent, with a TV and refrigerator). To Caesars' credit, I felt the need to add the exclamation point. If you've ever ventured through Caesars Palace, chances are you probably got lost within the huge property (at least) a couple of times. At the resort's five-acre Garden of the Gods pool, it's easy to lose your way here too. But we can honestly say you'll have a blast by doing so! Offering seven pools, this sprawling area provides something for everyone. Once you get used to your surroundings, you can't wait to take a dip in all the pools. And with the stunning, dramatic Roman architecture and sculptures, it's almost like being in Italy.